Tikhon Lavrischeff arrived at Angel Island from the President Pierce on July 12, 1923. He would have been admitted as soon as the immigration processing was completed had not the quota for Russia been exceeded that month. Along with 135 other compatriots he was excluded from entering the country. Lavrischeff spent three months at the immigration station before he was finally able to restart his life in America. That life turned out to be short but extraordinarily full, the sojourn at Angel Island punctuating almost two halves – Russian and American. Tikhon Lavrischeff, aged 27, a widower, had spent five years in the military: 1915-17 in the Russian Army fighting in the Great War and until 1920 with the so-called White forces, in his case, the army of Admiral Kolchak in Siberia, achieving the rank of shtabs-kapitan (major). Before entering the Army, he had graduated from an ecclesiastical teachers seminary. At some point, perhaps in 1920, he had taken gymnasium-level exams for university entrance, studied two years at the University of Tomsk, and later for a year at the Faculty of Law in Harbin, Manchuria.1 The transcript of the Board of Special Inquiry hearing at Angel Island reveals an interesting fact about Lavrischeff: unlike many of his compatriots with similar education and military background, he also possessed practical skills, that could be called upon to make a living right away. In answer to a question from one of the immigration inspectors, he acknowledged he had worked for four years as a carpenter in Russia and had built three houses in Harbin (while studying at the Law Faculty). At Tomsk University (ca. 1920-1922) he did “newspaper work in the office during the day.” This combination of pursuing an education along with practical work, unusual in pre-revolutionary Russia, would be enormously helpful in his new North American life. Nothing in the transcript of the board of special inquiry interrogation at Angel Island suggests that becoming a priest was part of Lavrischeff’s plan for his new life in America. 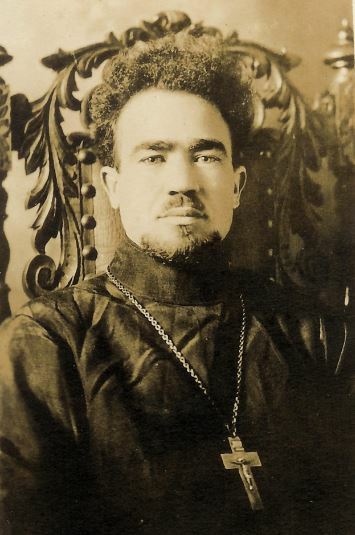 Although he had participated in the work of a religious brotherhood in Harbin, becoming a missionary priest in America seemed to be a detour from his original intentions of completing his education. Yet in Alaska he found his life’s work. After his ordination on January 4, 1925 by the Bishop of Alaska, Fr. Tikhon Lavrischeff embraced his work and the Native people whom he was serving. Lavrova provided more information that well summarizes Fr. Lavrischeff’s activities in Alaska as well as his altruistic values. The Russian priest was likewise appointed teacher of the native public school by the U.S. Bureau of Education. Before he got his appointment [he] earned his living successively as night watchman, mechanic and grocer, a veritable priest in overalls. He refuses to take any pay from his native flock, as these are too poor, and for the same reason refuses donations from the few Russians in the North and the Greeks and Slavs, workers in mines and canneries of Alaska. The occasion for the interview by the Examiner reporter was Fr. Lavrischeff’s arrival at the University of California, Berkeley, for the 1927 summer session to take courses in the education department. Apparently Lavrischeff had not given up his plans to continue his education and perhaps been prompted to return to university by his experience teaching in government schools in Alaska or even encouraged by Fr. Kashevaroff. After this short leave-of-absence, the priest returned to his teaching and church duties in Alaska. Fr. Lavrischeff probably learned during his summer at the university that he could complete his bachelor’s studies in two years. Even for graduates of the Russian gymnasium, without university-level work, the University of California granted two-year’s credit toward the B.A. In July 1928, Bishop Aleksii in San Francisco appointed Fr. Lavrischeff as “temporary rector of the Berkeley parish,” presumably after his arrival in California.11 Whether a partial salary was attached to the position is unknown. After receiving his BA, “majoring in public schools administration and supervision,” “with honor” in 1930,12 the priest remained at the university for another year to complete his work for an MA. Throughout these years, as noted above, he served both in Berkeley and in San Francisco as time permitted. (He even returned to Angel Island with Fr. Vladimir Sakovich to visit recently-arrived refugees.) The priest always intended to return to Alaska,13 and he did so, leaving California in June 1931. Special thanks to Paul Lavrischeff for the photographs of Tikhon Lavrischeff. Maria Sakovich is a public historian and independent scholar who researches, writes, and develops exhibits in the areas of immigration, family, and community history. She has written articles on Methodist women including Deaconess Katharine Maurer, a beloved social worker at the Angel Island Immigration Station, “A Russian Summer at the Immigration Station,” on this website, and “When the Enemy Landed at Angel Island,” from the National Archives and Records Administration’s website. Resumé [November 1929], OCA Archives. See also File 22335/22-4 and Nadia Lavrova, “Religious Relics in Alaskan Mission,” San Francisco Examiner, June 26, 1927, p. 10E. “Russians in America,” Russkii Golos, Harbin, May 17, 1924, found in File 150.616, Box 140, Entry 702, RG 59 (Department of State), NARA, Washington, DC. For his paid work, Fr. Kashevaroff convinced the Territorial Legislature of Alaska to fund a museum and library, which he organized; he was appointed curator in 1920. Richard Pierce, Russian America: A Biographical Dictionary, entry Kashevarov, Andrei Petrovich, pp. 215-16. “Testamonial” [“Attestat”] detailing Lavrischeff’s years at the Samara Ecclesiastical Teachers’ Seminary, 1912-1915; he received highest marks for all his courses. A copy of the handwritten document was supplied by Karen Schlussel. Tatiana Pope [Popova], “Three Unforgettable Years in Tomsk–Siberia, Russia” unpublished memoir , Bancroft Library, University of California, Berkeley. Tatiana Popova was also a member of St. John the Baptist Russian Orthodox Church in Berkeley, though she and her family may have been living in San Francisco during the Lavrischeff years: Maria Sakovich’ 1990 interview with Mrs. Popova. Letter from Fr. Kashevaroff to E.O. Essig, 6 July 1927, Folder 4, A.P. Kashevaroff papers. E-mail communication from OCA archivist, Alex Liberovsky, 23 July 2014. “Alaska Priest Honor Student At California,” Fairbanks Daily News-Miner, 4 June 1930, p. 6. The newspaper article also reported that Fr. Tikhon was elected to membership in Phi Beta Kappa. “Fr. Lavrischeff about Alaska,” Novaya Zarya, 25 December 1928; “Russian Priest Will Hold Services Here,” Berkeley Daily Gazette, 10 January 1929, p. 12. How Fr. Tikhon left the priesthood is unknown. No record has been found regarding “laicization” or any other form of leave-taking for him, but according to OCA archivist Alex Liberovsky, “records were not kept well during that period.” His marriage to Mary Eloise was performed by an Episcopalian minister in Modesto, California, and Fr. Andrew Kashevaroff baptized the couple’s first-born son John in Alaska. During his short career after leaving Berkeley, his years as priest in Alaska were always acknowledged. Copy of graduate transcript for Ed.D. studies, University of California, Berkeley, Office of the Registrar. “News Notes,” American Archivist, Vol I, No. 1 (January 1938), p. 28.